To do the Drieghan story quest you must have completed the Kamaslyvia Part 2 questline. Below is the map of Drieghan and all of it’s node connections. Drieghan is a mountainous territory and is the ancestral home of the dwarves and giants. However, the dwarves were expelled by the giants who rebelled against them and now the giants occupy Drieghan whilst the Dwarves currently live all around the world with the humans. Dragons have also been spotted all around Drieghan, including Kamos the red dragon. Drieghan is situated south of Serendia, southwest of Mediah, and east of Kamasylvia. Duvencrune is the capitol city of Drieghan. There is an indoor and outdoor hotsprings located in Duvencrune which will give you a special buff if you bathe in it. The maximum amount of players that can bathe in the indoor hotsprings is 5, whilst there is a maximum capacity of 10 for the outdoor hotsprings. All housing in Duvencrune costs between 6 – 10 CP each. Quest reward from Drieghan daily quests. Chance of dropping from all monsters. Higher chance of dropping from monsters in Drieghan. Used to repair Dragon Slayer weapons and craft Hesed’s Crystals. Can only be crafted at Duvencrune house 5 > workshop level 1. Can only be crafted at Duvencrune house 5 > workshop level 2. A new craftable Awakening weapon called the “Dragon Slayer” has been added. The weapon can be crafted in Duvencrune house 5, which is in the capitol city of Dreighan. The materials for the Dragon Slayer must be crafted or obtained from monsters and quests specifically in Drieghan as well. The new weapon’s AP is almost identical to a Dandelion weapon and also has a+5 additional damage to humans item effect. To restore it’s maximum durability, you can also choose to use Memory Fragments or a new item called “Refined Remains of Black Energy” which is used to craft the weapon and drops from all monsters in Drieghan. Blue grade armor set. Obtained from all Drieghan hunting zones. Similar to Grunil/Rocaba armor. Leebur’s Gloves are similar to Bheg’s Gloves but have 2 more DP on them at PEN and high evasion but with much lower accuracy. Crafted using materials from daily quests (at Hugol NPC Blacksmith) and processing/crafting. Can only be crafted at Duvencrune house 5 > workshop level 3. Cannot use cron stones on this item. New crystals sockets have been added that can be put in all gear. Putting more than one of the same crystal in your gear will give you a powerful set effect. You can also enhance the crystals for additional item effects using Kamos Scales, which can only be obtained from the new world boss “Kamos”. Other crystals have been added as well which requires an item drop from Red Wolf Town monsters. New accessories have been added which drop from different grinding zones in Dreighan. New recipes have been added which require materials from Drieghan. Lakhairo is a plant that grows in Drieghan only. To collect Lakhiaro you will need a Doster’s Steel Hoe, which can be purchased from some Material vendors, or a Magical Manos Hoe, which is crafted using processing. When you attempt to collect Lakhairo, a new gathering mini-game will begin! The goal of the mini game is to dig around the Lakhairo and remove it without damaging it’s roots or hitting the stones. 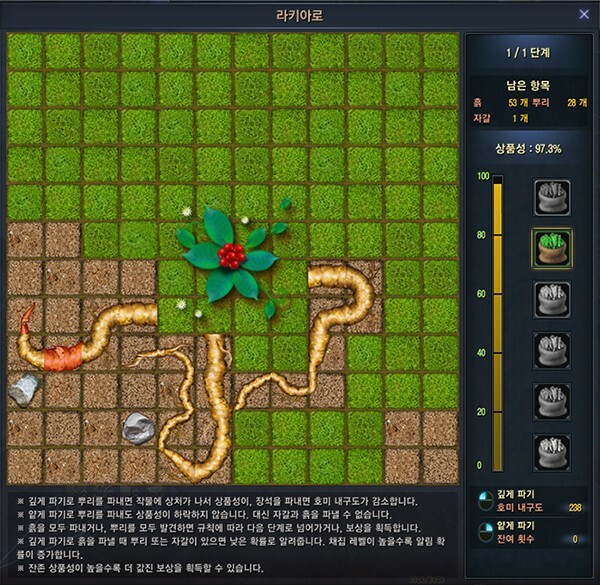 The number of roots, dirt and stones remaining is shown in the mini game window. You can choose to dig deeply with LMB, or dig slowly and more cautiously with RMB to reveal what might be under the soil. But the amount of times you can dig slowly is limited and depends on the enhancement level of your Hoe. The hoe starts off with 10 RMB clicks and will increase by +1 per enhancement level, once you reach enhancement level +10 or higher. The rewards you get from the mini-game completely depends on how much damage you do to the Lakhairo roots. The maximum reward you can get is an item equivalent to 10 million silver. There is an NPC in Dreighan which will give you a tutorial for the mini-game as well. You do not need to have durability on your hoe to gather a Lakhairo, but it’s enhancement effects (amount of RMB clicks) will not take effect during the mini-game. Three new grinding zones have been added with Drieghan which are designed to be different difficulties, with some being solo grinding spots and others for a party. Black Energy Residue can drop from all 3 grinding zones and have a much higher chance of dropping than in other areas (such as Mediah/Valencia). Marni Stones have also been added for each new area for levels 58 – 61. Sherekhan Necropolis is a totally unique grind spot because it has different monsters in the day time and different monsters at night. During the day (7AM – 10PM in-game time), the monsters are as difficult as the monsters at Pila Ku Jail. At night however, the monsters become as strong as Laytenn and are very difficult. Marni Stones are seperated as well for the different monsters and you must get a day/night marni stone depending on when you grind here. This zone is designed for party play and requires at least 220AP with the Kutum offhand. Item drops include: Black Stone (Weapon), Black Stone (Armor), Combined Magic Crystal – Macalod, Combined Magic Crystal – Hoom, Orkinrad’s Belt, Akum Armor, Akum Shoes, Akum Gloves, Akum Helmet, Caphras Stones, Ancient Spirit Dust The yellow grade belt that drops here can also be created by combining two of the Orkinad Sculpture loot items (Leather Knot and Metal Ornament) in a [-] shape. Obtained from the world boss “Garmoth the Red Dragon”. Used to create more powerful crystals. Obtained from the world boss “Garmoth the Red Dragon”. Obtained from the world boss “Garmoth the Red Dragon”. Used to create the pet “Young Crimson Dragon”. The new item “Garmoth’s Heart” can be processed using Processing (L) > Heating to create a “Inverted Heart of Garmoth”. You will also need a “Inverted Energy” which is obtained through a quest in Drieghan. An Inverted Heart of Garmoth is used to reform Nouver/Kutum off-hands and turn them into a Fiery” Nouver/Kutum. It has a 100% success rate and will put additional item effects onto your Nouver/Kutum. These stats are: Max HP +150, Max Stamina +100 and Special Attack Evasion +10%. Other loot includes Garmoth Scales, which are used to craft new crystals. Finally, a new item called “Dragon Egg Fossil” can drop from Garmoth that can hatch into a pet (Young Crimson Dragon) by pressing RMB. 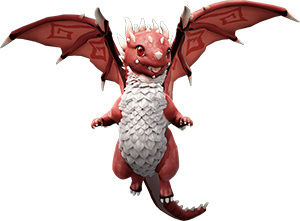 The Young Crimson Dragon will have one of the following special skills: Heatstroke/Hypothermia Resistance, Hostility Detection, Auto-fishing time reduced, Taunt Monsters, or Finds Named Monsters. The dragon pet also has a Max HP +25 talent and acts like a normal pet.